Nicolaas Bloembergen was born in Dordrecht, the Netherlands, on 11 March 1920 and he died in Tucson, Arizona on 5 September 2017 at the age of 97. He obtained the Phil. Cand. and Phil. Drs. degrees at the University of Utrecht in 1941 and 1943, respectively. After surviving World War II in Holland, he came to America in the spring of 1946, walked into Professor Edward Purcell's office at Harvard University and requested the opportunity to do graduate work in the emerging field of nuclear magnetic resonance. This fateful step started a lifelong association with Harvard. It also set the future pattern for his scientific work, which began with magnetic resonance and evolved in a natural way in quantum electronics, non-linear optics, and lasers. Bloembergen returned briefly to the University of Leiden in Holland to defend his thesis and receive the Ph.D. in 1948. His Ph.D. thesis, "Nuclear Magnetic Relaxation," investigated what controlled the shape of spectral lines, which can occur when atoms in their excited state emit radiation. This research was used to write what became the classic Bloembergen, Pound, and Purcell paper (BPP) published in the Physical Review in 1948. A measure of the continuing influence of his Ph.D. thesis is that it was first published as a book in 1961 - a full thirteen years after he graduated. 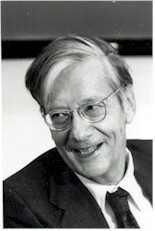 Bloembergen spent more than forty years at Harvard University and was considered the father of nonlinear optics, which investigates how electromagnetic radiation interacts with matter. In 1949, Bloembergen returned to Harvard as a Junior Fellow of the Society of Fellows. He became Associate Professor of Applied Physics in 1951, Gordon McKay Professor in 1957, Rumford Professor of Physics in 1974, Gerhard Gade University Professor in 1980, and emeritus in 1990. After retiring from Harvard, in 1991, he relocated to Tucson, Arizona and became affiliated with the University of Arizona, College of Optical Sciences. Bloembergen´s work in electron spin resonance led to his invention of the three-level solid-state maser in 1956. This found use as a microwave amplifier and was a forerunner of the subsequent laser developments which rely most heavily on the three-level pumping system. Primarily in recognition for this work, he shared the Morris Liebmann Memorial Award of the Institute of Radio Engineers for 1959 and the Stuart Ballantine Medal of the Franklin Institute in 1961. The rapid evolution of quantum electronics into the optical region led Bloembergen into the field of nonlinear optics of which he is one of the founders. The last two two decades of his scientific work emphasized laser spectroscopy and laser interaction with matter. His excitement with science and his productivity continued at the same high level from the time he was a young scientist to the end of his career. His magnetic resonance work was recognized by the Oliver E. Buckley Prize for Solid State Physics awarded by the American Physical Society in 1958. In 1974, he was awarded the National Medal of Science by the President of the United States for pioneering applications of nuclear magnetic resonance. His other awards include the 1979 Frederic Ives Medal of the Optical Society of America for contributions to nonlinear optics and the 1981 Nobel Prize for Physics for his contributions to the development of laser spectroscopy. The IEEE awarded him the Medal of Honor in 1983, "For pioneering contributions to Quantum Electronics including the invention of the three-level maser." The tremendous demands on his time brought about by all these honors have always taken second place to his commitment to teaching. Bloembergen never changed his fundamental personal values which are marked by a sincere modesty. An important influence has always come from his wife, the former Deli Brink. They were married in June 1950 and became the proud parents of Antonia, Brink, and Juliana. He was survived by his wife, three children, and two grandchildren. This page was last edited on 14 September 2017, at 15:05.